Kind code are appended to patent document numbers to distinguish the kind of patent documents. Most jurisdictions since 2001 have harmonized kind codes based on the WIPO ST.16 standard. As a general rule type A kind codes are applications and type B documents are granted patents. Kind codes may be searched using the KCOD field code in AcclaimIP. Kind Codes are particularly useful when searching European patent documents. All EP applications have a kind code that begins with the letter A and all EP granted patents have a kind code that begin with the letter B. See examples below. 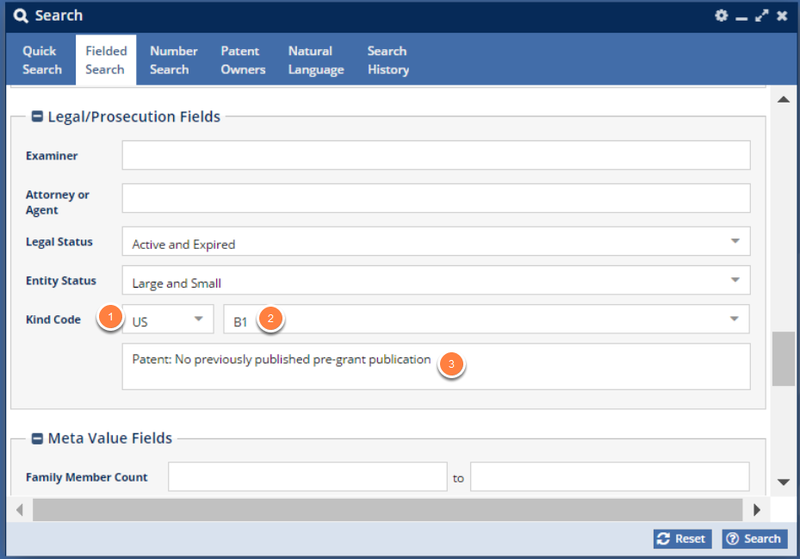 The Fielded Search option contains short definitions for each kind code. Select the jurisdiction (country) (1), then choose the Kind Code from the drop down (2), and a kind code definition will appear (3). You can always search using the Advanced Syntax as well. KCOD:B1 --> The example shown above finds documents with kind code B1 (no previously published pre-grant publication). KCOD:B* --> When searching EP document collections it returns only EP patents (and removes EP applications). KCOD:A* --> When searching EP document collections it returns only EP published applications (and removes EP patents). I gave you the KCOD:B1 example which has an interesting implication for US patents. Applicants may choose NOT to publish their applications and file a nonpublication request, and you will never know about it until the patent grants. The limitatiion for the Applicant is that they are limited to patenting in the US if they take this strategy (See MPEP §§ 1123 and 1124). So searching for B1 documents in the US collection gives you some insight into an applicant's patenting strategy.